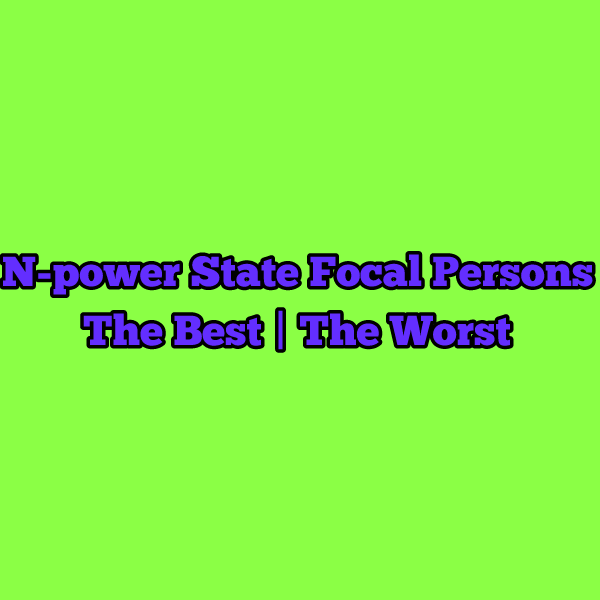 Who is the best NpowerNG State Focal Person? Last year when N-power formally took off, Federal Government mandated every state governor to nominate focal person, which they did. 4) To serve as bridge between volunteers in their state and Npower Headquarters in Abuja. 5) To help Implement monitoring measures in their state so as to ensure efficiency from the volunteers. While some of State Focal Persons have been wonderful as reported by volunteers in their state, some of them have fallen below expectations. "Which Focal Persons have been the most helpful and which have been the least helpful.?" "Voice of man", they say, "is voice of God." To Solace Onyema, Abia State Focal Person, "played the role of father to them. "Abia state focal person has been most helpful, he's a man with a heart of gold, he's a father to all the N-Power Volunteers in Abia state. He's always there for us." Ebonyi State Focal received the "baddest" assessment of them all. He was accused of extorting monthly clearance fee from volunteers in the State. This extortion has been on early this year in the State. Infobase earlier reported this case, but nothing was done about it. People will say whether you do good or bad. Inakefe Blessing, a volunteer in Cross River State commended her focal person for the supports she has given volunteers in the state. According to her, "Cross river state Dr.Mrs Nkoyor, is the best, she always organize conference/workshops for all the local government education authorities and health coordinators regarding Npower. She gave out her numbers and office address to Npower volunteers. "All the ES writes report concerning the volunteers in their various LGA to her monthly to know all the volunteers that are active & non active ones. She has work tirelessly to ensure the effective implementation of the programme. I attended one of the workshops she organize at channel view hotel infact she was warning all the ES and health coordinators not to collect money from any volunteer for any reason .God bless her, Kudos to her." To one of the volunteers in Plateau, Ene Pauline Oketa , Plateau State Focal Person, Dr Sumaye Hamza, "is the Overall Best and the most Helpful. Her Love for us is immeasurable. A mother indeed!" "Dr Sumaiya Hamza, plateau state focal person remains the best and stands out. Gaskiya she has a mother's heart and is so patient and understanding with volunteers on the plateau. God bless her jor." Ilegbemi Idowu Joshua, an N-power volunteer in Niger State said the State Focal Person deserved an award for her meritorious services to resolving Npower-related issues in Niger State. "In fact, to call a spade a spade. Hon. Afiniki Dauda Eunice focal person to Niger state npower beneficiaries has been of great help to us. Though, there are short coming,but she tried a lot. If she misses any of the beneficiary calls, she will call back. She keeps guiding us on how to solve our unpaid stipend. There are lot more of the woman. Npower,if you intend to give your award,Niger state focal person is the best. She is woman but act diligently like man. Kudus to her"
Another beneficiary of the job programme, Kabiru Usman Nahuche, said "Best on my own observation the most helpful focal person which attend people from her state and other state is Hon Afiniki Eunice Dauda from NIGER. Aina Oladele Emmanuel described Focal Person in Ogun as being dedicated in discharging his responsibilities. "Ogun State vocal person should be given kudos for a job well done. He's a man of integrity. If there is any award for vocal person, he deserves it. Dedicated, committed, passionate, faithful and accommodating." More than 10 volunteers in Kano State unanimously submitted that they're not impressed by the attitude of Kano Focal Person towards beneficiaries in the State. They described her as the worst State Focal Person of the scheme. One of them, Ismail Badmous, said, "I swear to God...the least, the worst and the most irresponsible focal person is KANO N-Power person, Hajiya Aisha Jafaru...she is so lazy, shallow minded and devilish in nature." Another volunteer,Jami'u Abubakar Usman, who said he has never had any since the commencement of the scheme, however judged her based on general views of volunteers in Kano. "Though i have no any issue to meet her, but my colleagues who have some problems when they meet her, the focal person of kano state they always be disappointed and discouraged by her attitudes, i can even mentioned that when journalist try to meet her to hear from her why their is that much complaints the outcome is another disappointment." Mr Yerima at the Ubeb office Abuja. I think he is Mr Yerima by name (the tall hausa looking man) . He sit inside the first office to the right and in charge of posting. He is such a wonderful human being, that made me believe we have exceptional civil servants in this country. I am not into npower but happen to interact with volunteers and saw the way he attends to them unlike other I have seen. The voice of the people is the voice of God, I am not a beneficiary neither I have the intention but Kano, Ebonyi and Zamfara should be investigated. Bamikole Felix said Kwara State Focal Person has been generous in area of even encouraging Kwara-based youths to embrace the job initiative, apart from assisting volunteers to resolve their challenges. "Kwara state focal person is helpful and even d focal person organised free registration for those that are willing to apply for npower,even without seeing the federal monitorin he supervised and organised sensitization program for the beneficiaries." While volunteers in Kano, and Ebonyi states condemned their Focal person, Muhammad A. Yusuf, a volunteer in Gombe State described the state focal officer as being committed. "No one like my Focal Person of Gombe state because she is committed and dedicated all the times. She even uses her personal belonging for the happiness of her beneficiary. We really love her," he said. Is your State Focal Person doing his or her Job the way he/she should? N-power is the job initiative of Federal Government in Nigeria, which is designed to reduce unemployment among young Nigerian graduates.